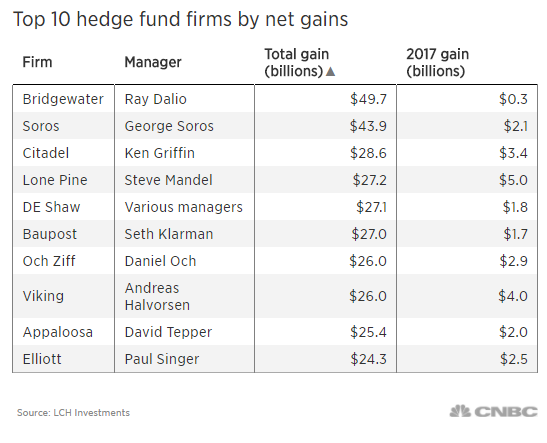 Ray Dalio’s Bridgewater Associates has the biggest cumulative net profit for a hedge fund firm ever, according to data from LCH Investments. Bridgewater is the world’s largest hedge fund, managing about $160 billion, according to its website. Dalio started the firm in 1975 out of his two-bedroom apartment in New York. He is now worth an estimated $17 billion, according to Forbes. Second on the list is George Soros, with nearly $44 billion in total gains and a $2.1 billion profit last year. Soros is best known for making $1 billion betting against the British pound in 1992. He currently manages money only for himself, his family and his various foundations. Next was Ken Griffin’s Citadel at $28.6 billion. Stock picker Steve Mandel’s Lone Pine Capital had the largest gain of any hedge fund firm in 2017, at $5 billion, and is now ranked fourth overall. LCH Investments told Institutional Investor it was not able to get audited information on Renaissance Technologies’ performance for that firm’s ranking. 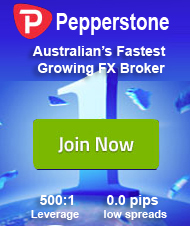 OUR BEST FOREX EXPERT ADVISORS. Fully automated trading! We confirm the results on real verified Myfxbook accounts!